Increase Staff Loyalty and Engagement with Recognition Awards! The legal industry often deals with disengaged employees and low employee retention rates. Creating and sustaining employee engagement can increase employee loyalty and also help to retain workers. Recognition award programs are a proven method of improving employee engagement at a law firm as these programs provide a way for firms to recognize and reward workers. Approximately three in four legal professionals are currently not engaged. Not only do employees crave recognition for a job well done, but can feel more engaged and productive on a consistent basis when they receive recognition through an employee award program. Often as a result of implementing an employee engagement program, employee loyalty will increase. A law firm wanted to reduce its recruiting costs and increase employee engagement. Awards Network designed three different recognition award packages for the law firm to reward employees on their anniversaries, recognize employees for an above and beyond performance and also for providing outstanding client service. The recognition award packages were customized with the law firm’s logo and personalized with the recipient’s name and accomplishment as a special touch. Inside the award package, there was a recognition letter and a certificate of appreciation signed by the senior partners of the law firm. An award catalog with over 70 lifestyle merchandise items and an order form was also included in the recognition package. The law firm conducted an engagement survey before the implementation and after a year of the employee engagement program. The number of disengaged employees decreased from 70% of workers to fewer than 40%. In addition, employee retention increased by 14% over the course of the year. 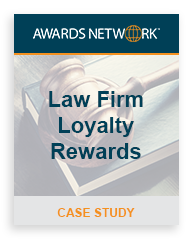 Want to learn more about how your law firm can benefit from an Awards Network employee engagement program? Contact Awards Network to discuss how our award programs can work for your organization.